Ravager is my personal favorite class in the game and I have been playing it almost exclusively since the game came out. I played on AK US server from when it was released to when plus 30 was just introduced into Taiwan server. English is my 3rd language so sorry for it not being perfect. Anyway getting into the overview, Ravager is a melee class its main element is flame. It requires moderate to lower ping to play to its fullest due to how important auto attacks are to the class’s overall damage. Since of course higher ping makes it harder technically to jump cast. Id rate it probably the 3rd best dps only behind Lancer and Shuri (yes i know all you holy sword mains gonna get butthurt but consistent damage>inconsistent zeal class imo). Anyway back to the actual guide. ^This is the weapon you will be using until level 90. The core that i recommend is Destroyer. The effect of said core is 20% chance to reduces target's Defense by 10%. Element should be Flame since your main DPS skill will be Flame Slash. Full Lordswrath will be the ideal/best set to use for any dps until level 90. To give a quick rundown of why, it provides alot of detail dmg to bosses as well as Crit dmg to bosses and speed,Crit,Speed and flat dmg as well. ^Next we have bottom set as with the top set full Lordswrath bot set its bonus is detail/dmg to bosses crit dmg to bosses and a DOT effect that's more or less useless but it’s still the best set . Again for cores, still 3% MS unless you can’t afford it then next alternative is bestials. As with Guziglas tooth it provides Dmg to bosses 7% but this trophy has a neat effect of having a 8% chance to increase all stats by 3% stacking 3 times so 9% in total. This will help with countering dungeons -stat reductions. This trophy though does not need to be imperial since when you are not on a boss you will be swapping it to the next mentioned trophy so feel free to use any core you would like. ^This is the next trophy we will be talking about as it may seem very apparent its stats are nowhere near as good as the above mentioned ones. This is because you will only be using this when you are running between bosses or doing anything that's not killing bosses move speed is a important stat in this game learn to love this trophy it is in fact life in Aura Kingdom. This core however NEEDS to be Imperial as the whole point of it is movement speed to help you get around faster as its natural effect is 5% move speed and thats 5% more than the previously mentioned trophies above ( not make sure your Tooth trophy is on the bottom slot and Theory time code is on the top as when you swap them it replaces the top trophy not the bottom. ^Next mention we have, I wont go into a lot of detail but is the level 65 Elemental trophies in my opinion are a good swap at this level if you can fort them to plus 20 but these are again OPTIONAL bassically what these offer are 20% dmg to the respective element and 10% dmg of what ever ele the trophy is for for most players these are a luxury. Now with this there are 2 sets to consider both are almost the exact same actual damage so pick whatever one suits you best or is cheaper. We also now have them purchasable with Golden DP. Perfect war: this is the most common set to be found at this level since it provides Dmg/Crit/Speed and 20% elite monster dmg along with flat dmg from the set bonus, its a solid choice to use at this level. As you will notice, this keeps coming up but Imperial cores are a must. Arcane frost: the 2nd set you can use, it's roughly about the same overall dmg as perfect war as it gives dmg/crit/speed and its set bonus is flat speed and its other effect being crit dmg to elite monsters. Next level set we have is Levels 90-95 for the most part armor/accessories are pretty agreed upon but now with trophies this is the level range it starts getting more down to opinion and class variation. I'll only be talking about what benefits Ravager the most. By now I will assume you have red thru the level 80 sections so things like mentioning what cores imp/Bestials/noc/Dest will be a given. <-- This top set should be your goal it’s the only set worth upgrading at level 90 DO NOT USE MAGIC SUNDERING TOP I REPEAT DO NOT USE THAT SET. Now you might be asking, why not since magic top gives crit and it’s cheaper and you only lose 4 detail dmg and with future content over cap crit=crit dmg cap? Yes that last part is correct BUT most people say that without knowing how it actually works and how bad it scales with flat crit increase. From my personal tests on TW server the 2k crit from magic top since its Flat only gave like 2% over cap Crit dmg, hence it’s not worth using Magic sundering at all. If you cant afford this top set, stick to the above-mentioned Lordswrath. ^Next we have Magic sundering bottom. Unlike the top set this is actually good. Depending on stats and future content the main selling point to this set is its effect being Crit rate/Crit damage. This will probably be better and alot cheaper for most players in AK US/OS current content but I can't stress enough, ONLY magic sundering BOTTOM set is worth it. The top set is trash tbh. The post was edited 7 times, last by Pilot ( Mar 13th 2018 ). This whole comparison comes down to for me the fact Detail damage sources are plentiful these days. As in, we’ll have 4% dmg SS’s coming to OS at some point, detail damage from Eidolon Archive, as well as detail drink (Latte) if you choose to use it. Now you might be asking what about destroyer cores -% def is important. Yes you are correct BUT 95 weapon has more use since as we know in TOA/SFL/OW TOA/SFL -def (destroyer cores actually is worthless) so 10 primary weapon damage suprasses it by alot. As well as you don’t need destroyer core to cap -50% def shred on Rav/Shuri. And you total -53% def shred with no destroyer core assuming you have a -8% eido accessory. Orange break defense is only 5% less putting you at 48%, but that 2% gap from cap isn’t game breaking so you’ll be fine. DO NOT USE ALMIGHTY MOUNT 20% all stats/20% dmg mount this mount is so bad compared to the other two choices. Only use if you have no other choice. In my opinion this is the best setup for mastery as we can see it hits all the needed parts 20% dmg to Dark, Lightning, Ice, Fire, 30 dmg 15 move speed. Now the other points can go where YOU need it will vary on person to person if you need speed dump the rest into speed and same thing with Crit. You don't need hp/ele resist/Crit dmg since why do you need resist to ele in a game that's DPS focused. HP just looks nice but no dmg increase so I don't care about it. Crit dmg on rav you dont really need. The reason Shuriken sub is so strong is because with Storm arts skill, each Tick will proc TF4 procs and that’s crazy damage. Shuriken Storm has 10% detail dmg boost, and if you are not flame slashing then Bloody Corruption is good in case you need emergency noc/hp. The post was edited 1 time, last by Pilot ( Mar 13th 2018 ). Awakening is such a cluster of things. Alot of new things come with it, I'll do my best to explain it based on my XP from the Taiwan server. 1st lets start with what most people think of when they think awakening. Over capped flat Crit becomes crit dmg cap. Basically over cap crit = crit dmg. Now if you read my brief spiel on Magic sundering top/bot and why the top set is worthless, it’s similar to speed overcapping where crit to crit dmg has really bad/poor scaling once you start to reach higher amounts. But on the flip side, stat caps raise as well. Meaning you need more of a flat stat to = 100% or 50% depending if you mean speed/Crit. So what I can tell you from my own char pre awakening on my Ravager I needed 27k ish crit to reach 100%. But post-Awakening, i needed around 35k to reach 100%. As you can see this is a large difference so stacking crit from spec/doing prayer is really important, not to mention dungeons debuffs for - stats become larger and larger. And that same thing applies to your speed you need more speed to cap its 50%. Crit procs given from say things like Magic bot increases the effectivity of each point of crit you have and lowers the scalings diminishing returns. On the other hand, flat crit from magic top only just makes all other Crit less effective and makes the diminishing returns higher. Next we have Eva over cap = absolute Eva. This is kinda meh since stat caps increase, it’s just the chance to dodge something 100% and things like accuracy won’t counter it. Last we have the skill dmg coeff’s boosts and change in Damage Calcs but those are something more technical, just know they exist and once you awaken all that slightly changes. The post was edited 4 times, last by Pilot ( Jun 17th 2018 ). The only thing I am wondering about is the level 75 shuriken sub weapon. I'm not too familiar with shuriken weapons, but is there a reason you suggest that one? Wouldn't the PVP weapons give a little more move speed (level 80 is 10% and level 90 is 12%) and is arguably equally easy to get just through farming Subterranean Ruins for a few days on a few characters or whatever and not require an enchant card at all? Edit: Oh, I see, with fortification bonuses, the level 75 shuriken gives 6% more move speed. I still think it's worth mentioning you have to +30 this to see it become better than the level 90 PVP weapon unfortified at all, and since most players can't afford to +30 their entire set I don't think 99% of players will be able to do this on just a move speed swap, so maybe include the PVP weapons and situations where either is better maybe. The post was edited 1 time, last by Sylver_Aura ( Mar 13th 2018 ). Loved reading the guide, especially how you took into consideration of the Awakening Patch that is to come soon in the future. what about the fortification bonuses on the sundering top just out of curiosity. 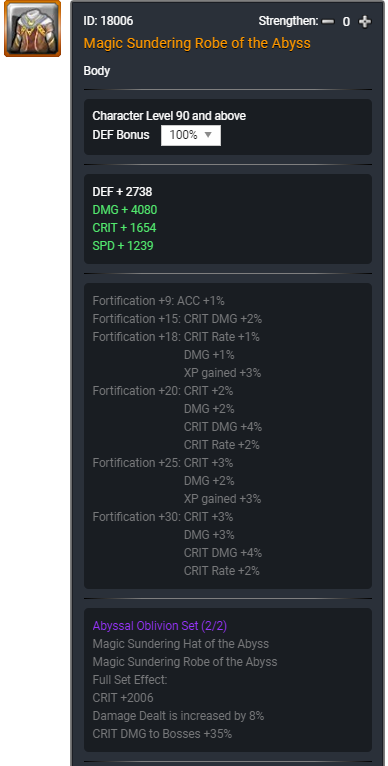 At +30 you get 16% crit while you get 0 on holy spirit. Is this the same as the 10% crit from the sundering bottom buff? Maybe YOU should get it right. I have magic sundering +30 and I tested it. You only get 4% flat crit % per piece, the translations are wrong. The rest are just % increase on the crit value, which are good if you are extremely undergeared but still not worth since the crit damage cap increase from them is barely noticeable. Pre-awakening you don't need that much crit chance and post-awakening you'd be better off with Abyss Roar set (20% crit against bosses) or Forest Wound set. The post was edited 1 time, last by Okada ( Feb 17th 2019 ).